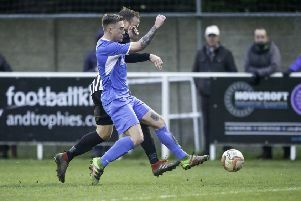 Frickley Athletic go from one Yorkshire derby to another, but will be hoping for a different result as they make the short journey to play Pontefract Collieries on Saturday. 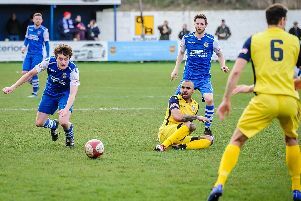 The Blues suffered a first home defeat since Martin McIntosh took over as manager when they were beaten 3-1 by Ossett United last weekend and will be more than keen to make amends against their near neighbours. But a tough test is in prospect with Pontefract currently sitting in second place in the Evo-Stik East Division and on a run of four straight wins. In contrast, Frickley have not won any of their last five league games and are down in 12th. The Blues have been building a reputation as a solid defensive unit, but conceded more than two goals for the first time under McIntosh when up against play-off hopefuls Ossett. They were without the injured Ben Algar and Todd Jordan while Tom Burgin was serving the final game of his suspension, but new signings Ousman Cham and Karl Byrne came in for debuts and did well. Gambian-born wide man Cham joined the Blues on a month’s loan from FC Halifax Town and went straight into the team. Cham has made a handful of first team appearances for the Shaymen and has also spent time out on loan with Glossop North End, Farsley Celtic and, earlier this season, Brighouse Town when he scored against Frickley. Byrne, a 22-year-old Irish born right side midfielder who had been training with Burton Albion recently, earned the supporters man of the match. Ossett were ahead from the sixth minute when former Frickley player Adam Priestley bundled the ball in from a corner. Tom Greaves and Priestley both missed chances to extend the lead and Frickley levelled as Tyler Walton found Cham with a fine pass and the new boy found the net with a clever chip over the goalkeeper. The game was halted when the referee pulled up injured and a suitably qualified official was found from the stands. But soon after getting back under way the visitors scored their second as Sam Liversidge’s attempted defensive header from a corner looped over keeper Hugo Warhurst into the net. A scrappy second half followed, but Frickley stayed in the game until the 88th minute when neat footwork from Aiden Chippendale saw him score Ossett’s third and clinching goal. Frickley’s day was made worse as they lost Miracle Okofor and Phil Watt to injuries.